Henry Sacheverell of Morley and Callow in Derbyshire, born in 1548, separated from his first wife Jane in 1593 (after she had borne him four children). After a spell in the Fleet Prison he settled at his house called Old Hayes near Ratby in Leicestershire with his mistress Elizabeth Kayes. His illegitimate son, Valence, was born there in 1604. Henry Sacheverell was a recusant - a Roman Catholic - and set up all his children with estates so that they could be men of substance in later life, perhaps as a device to spread his resources against seizure on religious grounds. Henry decided to provide for Valence while he was still alive rather than in his will, so he agreed in 1610 to buy New Hall, Sutton Coldfield, from the Gibbons family. Thomas Gibbons of New Hall together with his nephews Edward, William, John, and George agreed to sell New Hall to Henry Sacheverell of Morley for £1880. The sale was completed in 1612 by the “Livery of seisin” ceremony in which the boy Valence took part. Henry died in 1620, leaving New Hall to Valence in his will as already agreed - Valence was still living with his mother Elizabeth Kayes at Old Hayes. Meanwhile, Henry and Valence had bought a town house in Sutton perhaps because the Gibbonses were still occupying New Hall. Valence probably lived at New Hall from 1624, having married Ann Devereux of Sheldon Hall. A stone bearing the arms of Sacheverell was inserted above the entrance to New Hall, and a stained glass window of the Devereux arms can also still be seen. There were several children of the marriage, but only two survived infancy, George being born in 1632. Valence may himself have been a recusant, and when Civil War broke out in 1642 he was on the King’s side and against the puritanical parliamentarians. Unfortunately for him, Sutton and the whole of Warwickshire were under Parliamentary control, and he soon found himself in court. In June 1645 Cromwell and Fairfax defeated the royalist army at the Battle of Naseby, and the authorities set about silencing royalist sympathisers. In November 1645 Valence was found guilty of “Delinquency”, that is, being a royalist, “in deserting his house for the enemy’s quarters”, and the following January he was fined £502 “Because his estate lies under the King’s garrisons” (this may apply to Valence’s other estate at Callow in Derbyshire). Finally on July 9th 1646 the fine was paid and Valence was pardoned. 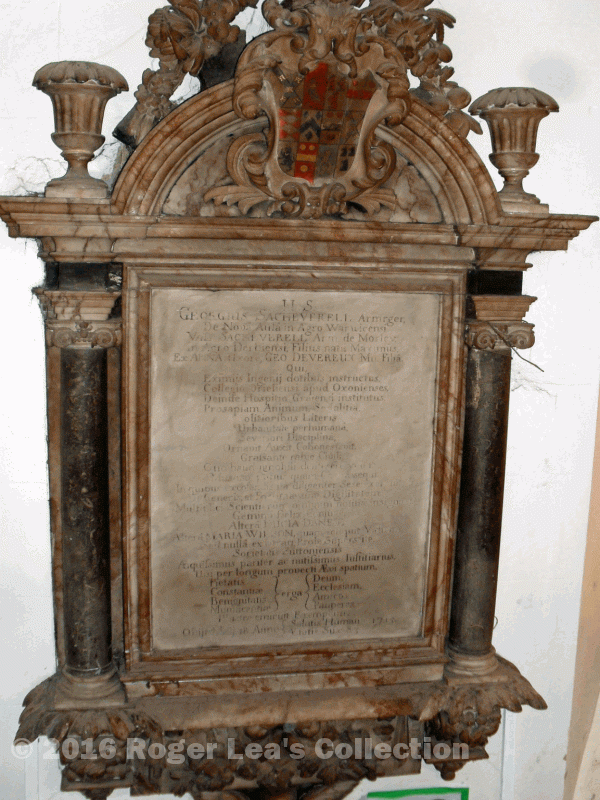 There is no record of Valence Sacheverell’s burial in the Sutton parish registers - perhaps he died fighting at the Battle of Worcester, or went to join the exiled Charles II and died abroad. By 1660 George Sacheverell had inherited New Hall. 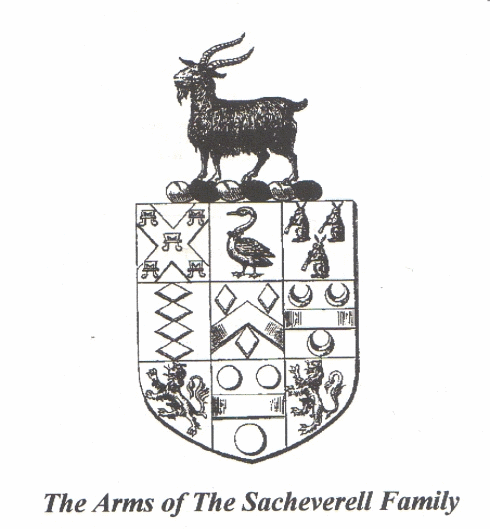 Arms of George Sacheverell on his funeral monument in Sutton Church. 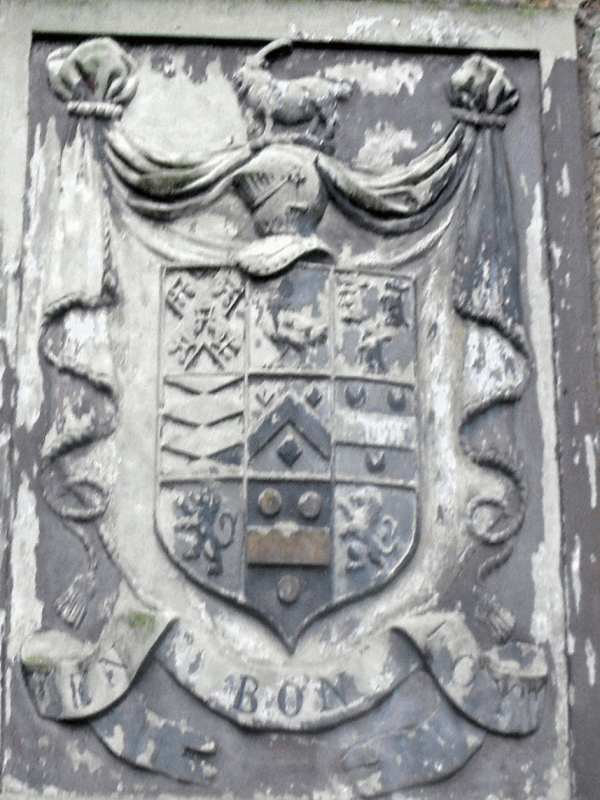 The extra panel on the right includes the Devereux arms of his mother’s family.